Robot Bike Company (RBC) is an emerging start-up established in the UK by aerospace engineers and mountain biking enthusiasts. When creating the company, RBC’s founders identified the potential of combining additive manufacturing technologies with carbon fiber to, in their own words, “create the best bike frames possible”. RBC’s goal is to use additive manufacturing (AM) technologies to create very high end mountain bikes that are built to order and tailored to an individual’s weight, height, and riding style, all within acceptable delivery timescales and manufacturing costs. Although the team at RBC had considerable experience in additive manufacturing and developing products and systems for the aerospace industry, it required multiple partnerships with industry experts in order to turn its ambition into a workable business. 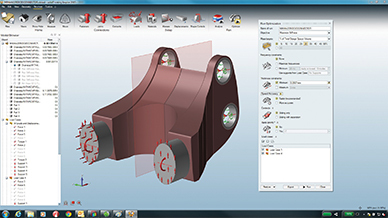 The team approached HiETA Technologies, a specialist in design and engineering solutions for additive manufacturing technologies, Renishaw, a leading developer of additive manufacturing machinery, and Altair ProductDesign who were given the role of ensuring that the bike took full advantage of the flexibility that additive manufacturing offers by deploying design optimization techniques. In recent years, there have been several interesting examples where 3D printing or additive manufacturing have been employed in the bike industry, but to date the manufacturing method has been limited to technology demonstrators or short-run manufacturing rather than a practical way of delivering commercial products to market. RBC’s goal for the project was to design and manufacture a fully customizable product that could be sold online to the public. AM is an exciting proposition to bike manufacturers as it has huge potential to allow for greater customization. However, designing bikes that take full advantage of the technology is a challenge that requires a great range of engineering and design specialties. To deliver on its promise of a lightweight, high strength bike, RBC’s frame was intended to be created from carbon fiber, a material very common in the industry. 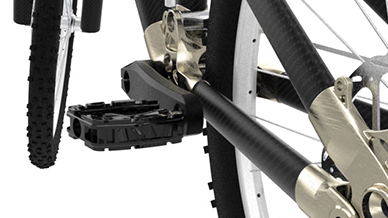 The carbon fiber tubes, as well as the bike’s other components and systems were to be joined by additively manufactured titanium ‘nodes’, manufactured based on the specification of individual riders (height, weight, riding style, etc.). Altair ProductDesign’s engineering team was tasked with designing these joints, which included the head tube, seat post, and chain stay lugs. 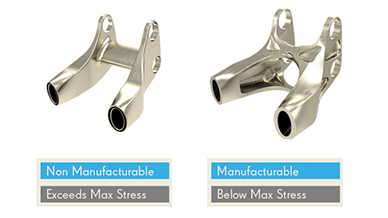 The goal for these parts was to ensure they were as lightweight as possible, yet still able to withstand the forces of downhill mountain bike riding, all while being fit to be produced with additive manufacturing. Altair ProductDesign’s first task was to perform optimization studies on each of the nodes to find a material efficient design that met the required performance characteristics and could be sized for different riders’ specifications. To find an optimal design solution as early in the design process as possible, Altair ProductDesign utilized Inspire. 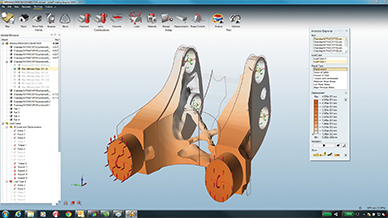 The technology allowed the team to quickly take the existing designs into the virtual environment and apply a variety of loading data that the bike frame would be required to withstand during use. Inspire used this data to output a new geometry that maximized the efficiency of the material layout while still achieving all performance targets. Throughout this process, the new designs had to be optimized for the AM process which included determining the ideal print angle and placement of the supporting structure to avoid the component collapsing during manufacturing. This process was conducted in conjunction with HiETA Technologies. In addition to designing weight efficient components, Altair ProductDesign was also able to look for opportunities to simplify the frame design to lower the cost of production. One such example was the chain stay lug which was originally a three-piece assembly of two symmetric titanium components and an interlinking carbon fibre tube. Utilizing both Inspire for optimization, and Evolve for final part refinement. The team was even able to build in the additive manufacturing requirements from HiETA Technologies, to redesign the lug as a single component, optimized for mass, performance, and manufacturing cost. The optimization work conducted by Altair ProductDesign successfully delivered mass optimized designs for the additively manufactured titanium frame nodes. The new material layout, driven by Inspire and interpreted with Evolve, created innovative, organic looking design solutions which were highly optimized for AM. Weight was reduced where possible and part count was cut in order to minimize manufacturing complexity and cost. RBC’s customizable mountain bike is a ground-breaking entry to the market that is using the very latest design and manufacturing techniques. Altair ProductDesign’s involvement and usage of Inspire and Evolve has contributed significantly to an extremely lightweight and strong frame which, with the close support of HiETA Technologies and Renishaw, can now be taken into production. Ed Haythornthwalte, Co-Founder of Robot Bike, Co. noted, "Using Inspire, Altair ProductDesign assisted Robot Bike Co. to further reduce the weight of our frame whilst also ensuring that stresses are kept below a predetermined maximum. This has allowed us to provide a lifetime warranty and give our customers confidence that the product will be enduring." Design and manufacture an innovative, fully customizable, 3D printed mountain bicycles. A process involving multiple partners to design, simulate, and manufacture, a fully customizable 3D printed and carbon fiber mountain bike frame. Lightweight bike frame that is customizable to each rider. Increased stiffness due to structural node redesign with Inspire and Evolve. Enabled by a radical new manufacturing technology, Robot Bike Company is pushing the performance envelope whilst also pioneering mass customization in high end composite full suspension mountain bikes. Robot Bike Company bikes are crafted digitally with form perfectly following function. Customers can tailor their machine to their exact requirements via an intuitive web interface featuring real time feedback.